What do we do when we have to go to an Excel Cell in some other worksheet (or a cell far away in the same worksheet). Normally, we select the worksheet tab, then spot the cell (which may involve scrolling) and then click on it. In this blog post, learn 2 quick methods to do this. Excel Watch Window enables you to keep a track of the values in selected cells. It is a handy feature if you have a couple of cells which you want to monitor as you work with your data. An additional benefit of Excel Watch Window is that can quickly take you to the cell/cells that you are monitoring. In the Add Watch pop-up, select the cell that you want to monitor. Note that if you select a range instead of a single cell, all cells would be added as separate cells. Note that double clicking on watch window to go the cell would not work if you are in some other workbook. Did you know?? Excel can store up to 4 temporary cell address, which you can use to quickly select that cell. This could be useful if you have data spread across various tabs and you have to refer to a few important cells again and again. These steps store the cell reference in temporary memory. 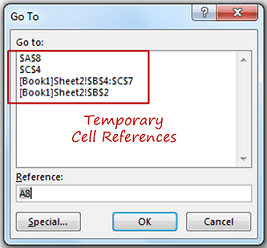 Note that Excel can store a maximum of 4 cell references at a time. If you add more reference by using the above method, you would only see the latest four references. Also, since this is in the temporary memory of Excel, it gets erased when you close the workbook. If your data has named ranges, their names would also show up in the Go To dialogue box. While there can only be 4 temporary cell references at a time, there is no restriction on the number of named ranges. How to Move Rows and Columns in Excel.